Wisconsin employers receive the benefit of a statewide court system that reports records to national databases very reliably. This results in comprehensive information, as well as the ability to keep costs down by eliminating the number of additional reports needed for a job candidate. In Wisconsin, Intelifi offers our National Criminal Report, and we also have direct access to a Statewide Criminal Report, as well as County Criminal Reports for every county court in the state. By utilizing these resources, you can rest assured that you will leave no stone unturned during your pre-employment screening process. 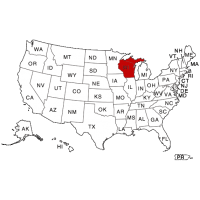 Wisconsin criminal background checks report all Felony and Misdemeanor convictions. These can range from serious crimes such as Grand Theft, to less serious offenses such as Possession of Drug Paraphernalia. Contact Intelifi today to being comprehensive pre-employment screening in the state of Wisconsin.